Photobook is awash with an abundant array of amazing personalised products to pick from, so don’t waste any time in shopping its range today. It’s so easy to use, simply upload your favourite photos, choose from the customisable layouts, fonts and backgrounds, as well as a few extra touches to maximise your products personality. Hey presto, you’ve got yourself a treat that’s totally personal to you, and showcases your favourite photo exactly the way you want. What’s more, if you’ve got a hefty order in mind, you should take a look at the bulk discounts on offer from Photobook to see if you could save yourself a small fortune. Whether for your business, your school or just for personal use, a bulk order from Photobook could cost much less than you’d think. Choose from scrapbooks, baby books, wedding albums, family compendiums and much, much more. Don’t let your memories get lost in the disorganised digital debris, print them off and cherish them forever with Photobook. How do I use my Photobook voucher? Sign up to receive Photobook’s newsletter and be the first to hear about exclusive news, deals and discounts. Does Photobook offer free delivery? Photobook offers free delivery for orders of $75 or more, however some products, such as clocks and framed prints, don’t qualify for free delivery. Does Photobook have an app? If you need to put your Photobook order through on your phone then you’re in luck, as Photobook’s amazing app, available for iPhone and Android, makes creating your products easy and intuitive. Does Photobook sell gift cards? A gift card from Photobook could well be the perfect present for a loved one. 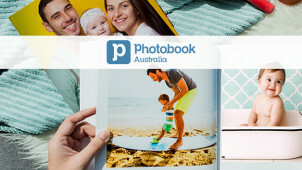 Available from $25 to $200, a gift card from Photobook is sure to put a smile on their face. All orders of $75 or more qualify for free shipping from Photobook. For all other delivery options, see here. You can get through to Photobook’s Customer Service team from Monday to Friday, 9am - 5pm. Bring your photos to life with Photobook, Australia’s leading supplier of amazing personalised photo products. There’s heaps of fun choices to pick from, from cards to calendars to canvases. Shop with a Photobook voucher and you’re sure to save yourself a pretty penny, whatever you’re after. There’s nothing quite like seeing your memories printed out, so choose Photobook today. You don’t have to be an adept graphic designer to get your head around Photobook’s amazing online design tool. More MS Paint than Adobe Photoshop, it’s so intuitive and easy to use that even the least technically-minded of us can come away with products we really love. Whether you’re making a photobook, a calendar, a phone case, or something else from Photobook’s amazing range, everyone can find something to treasure. Keep a smile on your face all year round with one of Photobook’s incredible personalised calendars. There’s an amazing variety to choose from, and when you shop with one of our Photobook coupons your calendar needn’t cost you the earth. Celebrate the possibilities of a brand new day every single day with a gorgeous custom calendar from Photobook, or gift it to a loved one to put a smile on their face 365 days a year.